The president’s midterm-campaign rhetoric of “invasions” and “national emergencies” is distracting us from a vastly different reality at the border. This reality bears no resemblance to what the president describes in his rallies. But we do face a historic humanitarian crisis, and the U.S. government urgently needs to change what it’s doing in order to deal with it. The data about migration, and about what crosses the U.S.-Mexico border illicitly, point to problems at the border. But they’re not the problems that the president is talking about. Instead, they point to a need to adapt our asylum system to a very different profile of U.S.-bound migration, and to build up our official border crossings—our ports of entry—instead of our walls and barriers. Here is what the data is really telling us. 1. There is no migrant crisis. In fact, the flow is near its lowest point in half a century. The number of migrants apprehended by Border Patrol at the U.S.-Mexico border in 2018—396,579 people—was the fifth lowest total since 1973. The number of adult migrants traveling without families (239,331) was almost certainly the second-lowest total since 1970. 2. The profile of a typical migrant has changed dramatically over the past five years. Two in five are now children and family members. That has never happened before. 40 percent of apprehended migrants were children and family members. That’s a new record, and was unthinkable as recently as 2012, when this proportion reached 10 percent for the first time. For generations before then, the typical profile of an undocumented migrant crossing into the United States from Mexico was a man, traveling without family. This man wasn’t fleeing threats or violence: he was looking for work or to start a new life in the United States. That profile is changing with dizzying speed. Children and entire families are now fleeing El Salvador, Guatemala, and Honduras: three countries with some of the world’s highest levels of violent crime, where they face direct threats from unrestrained gangs, an utter lack of protection from their own governments, and economies that have collapsed for the poorest. 3. 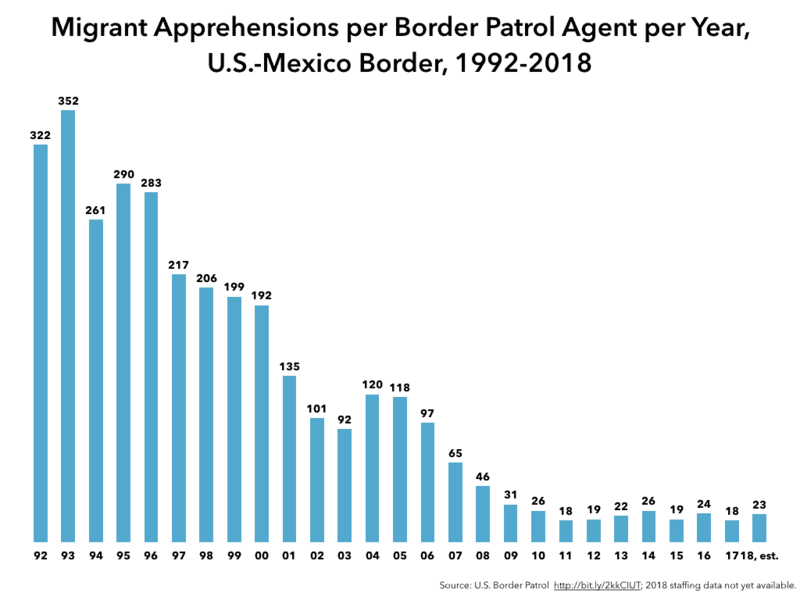 The number of people apprehended by Border Patrol has dramatically decreased over the years, because less people are attempting to cross. In 2018, the average Border Patrol agent apprehended 23 migrants all year long, even as his or her agency was assisted by a deployment of 2,400 National Guard soldiers. And since 40 percent of those were families and children—most of whom sought the agents out to request asylum—the average Border Patrol agent, in fact, apprehended 14 single adult migrants during all of 2018. One every 26 days. This points clearly to a need for more personnel to process asylum claims. It does not, however, point to any need to hire more Border Patrol personnel or erect more physical barriers. 4. Tough talk, threats, and “zero tolerance” won’t dissuade kids and families from fleeing. The administration’s anti-immigrant speech and chaotic, traumatic, painful policies have failed to stop Central American kids and families from fleeing their homelands. We are now in the midst of the third big wave of protection-seeking migration from Central America since 2014. The first wave ended when Mexico, with strong U.S. urging, cracked down on migration in its southern border zone. A second wave built up again, only to end with the January 2017 inauguration of a U.S. president promising an internal crackdown. But even as this crackdown gained force—climaxing, for now, with the horror of family separation during May-June 2018—a third wave of child and family migration has gained momentum. The 21,018 unaccompanied children and families apprehended by U.S. Border Patrol in September, plus the 3,921 who showed up at ports of entry, dwarf the small number of “migrant caravan” participants—1,000, perhaps?—who are likely to make it all the way through Mexico to the U.S. border. The conditions spurring these waves—violence, poverty, poor governance—are not ebbing, other than a modest decline in homicide rates. The most that crackdowns and tough talk have done is put Central American children’s and families’ flight “on pause” for a few months before, out of necessity, it resumes again. 5. Access to asylum is being throttled at the official border crossings. Jeff Sessions’ “zero tolerance” policy sought to arrest and criminally prosecute every migrant who crosses the border “improperly”—that is, at any point between the 44 official land border crossings, or ports of entry—even if that migrant is asking for asylum. The result would be to force asylum-seekers to avoid arrest by crossing at official ports of entry. “You are not breaking the law by seeking asylum at a port of entry,” Homeland Security Secretary Kirstjen Nielsen tweeted in mid-June. But at the same time as the flow was being diverted to them, U.S. Customs and Border Protection (CBP) agents at the ports of entry notably slowed their reception of asylum-seekers. 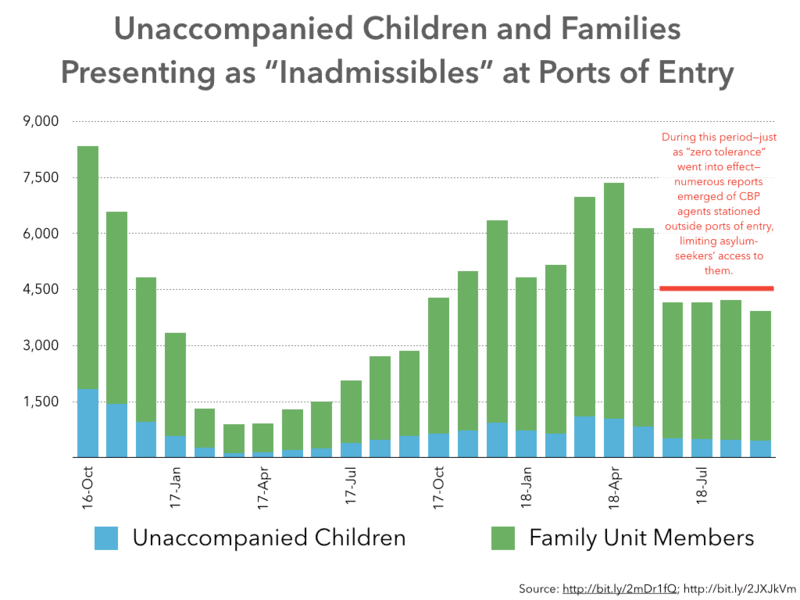 During March, April, and May 2018, more than 6,000 children and families reported to ports of entry as what CBP calls “inadmissibles.” Every month since June, however, the number of children and families at the ports has held mysteriously steady at 4,000 per month, even as “zero tolerance” was encouraging them to approach the official crossings. The numbers point to a deliberate effort to throttle asylum-seekers’ access to the ports of entry (see WOLA’s report on this, published earlier this year). Reports from sectors all along the border point to the same thing. Starting in May or June, most ports of entry began stationing CBP officers directly on the borderline, checking documentation and preventing asylum seekers from setting foot on U.S. soil, which would give them the right to ask for protection. Instead, the officers most often tell them to “come back later,” and accept only a very limited number of asylum applicants per day. At most crossings, this is probably not nefarious: it is more of a factor of the ports’ limited capacity to process and hold asylum applicants. The result, though, is that many asylum-seeking families who seek to enter the “proper” way are forced to spend days or weeks in Mexican border towns, some of them with high violent-crime rates and criminal groups that prey on migrants. The slowdown in the reception of asylum seekers at the ports of entry points to the urgent need to adjust to the border’s new reality of a new migrant profile, spurred by the unlivable conditions now reigning in Central America. 6. Mexico apprehends nearly as many Central American migrants as the United States does. Sometimes, Mexico apprehends more. Mexico routinely apprehends 100,000 or more Central American citizens on its own soil, and deports most. Just as in the United States, a sharply increased number are seeking asylum in Mexico as well. Asylum requests made to Mexican authorities increased seven fold from 2014 to 2017, and are likely to hit 20,000 for the first time in 2018. Already, nearly 2,000 participants in the October 2018 “migrant caravan” have already asked for asylum in Mexico. 7. It is extremely, vanishingly rare to find suspected gang members mixed in with families and unaccompanied children. Mid-2017 testimony from Border Patrol Chief Carla Provost explains that of about 260,000 children who arrived unaccompanied during the previous nearly six years, only 159 were even suspected of gang affiliation. Of this 0.06 percent of unaccompanied kids, about 56 were suspected of MS-13 membership. (See also WOLA’s fact sheet on the MS-13). The key word here being suspected. The U.S. government does not share its current list of “special interest” countries whose citizens, due to potential terrorism concerns, are given particular scrutiny when they arrive here. In an August 2018 report, though, the Center for Immigration Studies—an immigration-restrictionist think-tank—provides a very expansive array of mostly Middle Eastern countries that might possibly be on this list. Crossing this with Border Patrol data shows that, of all 303,916 migrants whom the agency apprehended at the U.S.-Mexico border in 2017, only 1,010—0.3 percent—came from the countries that CIS would consider to be of “special interest.” Of those, all but 222—0.07 percent—were from two countries, Pakistan and Bangladesh. Most of them were probably asking for asylum here. While we can’t ever discard the possibility that terrorists from outside our region might try to do harm by crossing the border from Mexico, there are simpler ways to them to get here, like overstaying visas. Talk of terrorists mixed in with children, families, and “migrant caravans” is irresponsible scaremongering that trivializes the threat of international terrorism. 9. Look for solutions in our asylum process and in our ports of entry. Both are in urgent need of help. 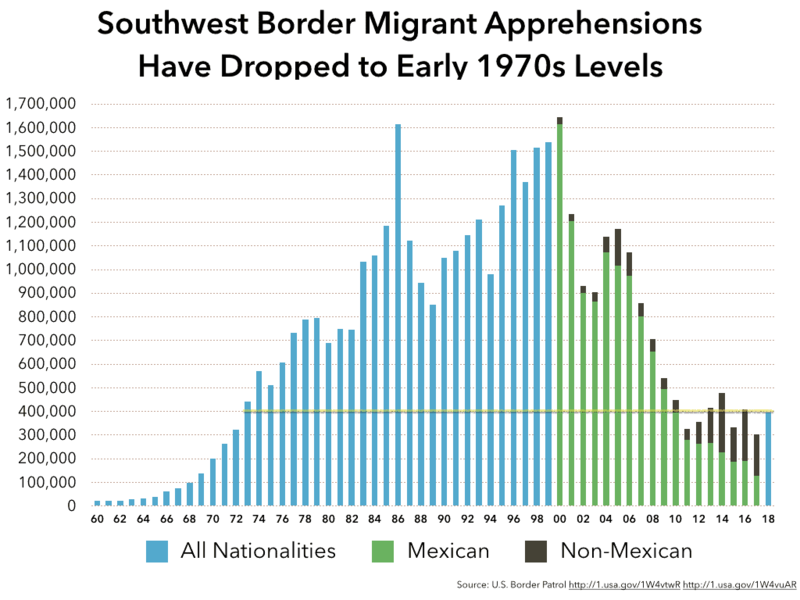 Large-scale child and family migration, from Central America and perhaps from elsewhere, is going to be a constant in the unstable world of the 2010s and 2020s. Instead of raging against it, we must start adapting to it. Much of the solution to all of this lies in two neglected U.S. institutions: the immigration courts and the border ports of entry. The backlog of cases in the immigration court system is untenable. Even asylum cases that result in a removal order are now taking more than 500 days to process. More judges are badly needed to reduce caseloads and wait times. The ports of entry—the 44 official land border crossings—are where the vast majority of illicit drugs cross the border (with the exception of cannabis, which is seeing sharply reduced transshipment due to states’ legalizations). But the ports have a severe staffing shortage of about 4,000 CBP officers, and unmet infrastructure needs totaling nearly US$5 billion. Building walls and hiring more Border Patrol officers would do nothing for ports of entry. The following charts, using CBP data through July 2018, strikingly show the importance of focusing on ports of entry for interdicting drug flows at the border. Building a border wall, hiring more Border Patrol agents, or sending more National Guard troops between the ports of entry would only affect the green parts of these charts. The necessity is at the ports of entry, the blue parts. CBP, Southwest Border Migration FY2018, and past iterations of this report archived here. Border Patrol Fiscal Year Southwest Border Sector Apprehensions (FY 1960 – FY 2017). Border Patrol Nationwide Apprehensions by Citizenship and Sector FY 2007 – FY 2017. Border Patrol Total Monthly Family Unit Apprehensions by Sector (FY 2013 – FY 2017). Border Patrol Total Monthly UAC Apprehensions by Sector (FY 2010 – FY 2017). Border Patrol Fiscal Year Staffing Statistics (FY 1992 – FY 2017). Government of Mexico Boletines Estadísticos – Unidad de Política Migratoria.